The Exhibition "Chinese and French Popular Prints," organized by the Central Academy of Fine Arts and French Cultural Centre, was opened recently at The Art Museum of Central Academy of Fine Arts, displaying collections of print works by Henri George and Wang Shucun. The print works from two printmaking centers, Yangliuqing in China and Epinal in France, document the ordinary lives of people living in two widely different countries in the past century. The Kitchen God, Qing Dynasty(AD1644-1911), Tianjin Yangliuqing, painted xylograph with process printing and hand painting. Originally, Chinese prints were carved into stone. The representative work is Wuruitu (Carvings of Five Auspicious Things, 171 B.C.) in Cheng County, Gansu Province. The printmaking technique then was not complete because of limited papermaking techniques. 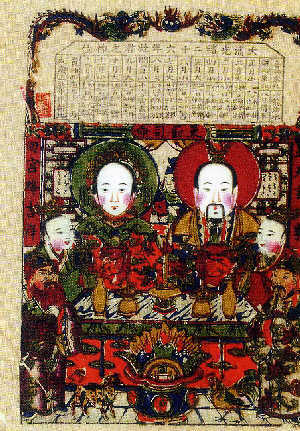 With the popularization of papermaking arts and woodcut techniques, the handicraft workshop for creating "menshen" (a door-god whose picture was often pasted on the front door against evil spirits), and "nianhua" (Chinese New Year prints) developed rapidly, and the woodblock prints came within reach of common folks.